Born in Plymouth, England in 1923, Gino Lorcini emigrated to Canada when he was 25. His youthful years living in Montreal during the 1950s and 60s had a tremendous impact on his artistic development. Lorcini studied with former Group of Seven painter Arthur Lismer at the Montreal Museum of Fine Arts, and met and befriended such artists as Yves Gaucher, Guido Molinari, Claude Tousignant, and Jean McEwen. He was also introduced to the writings of American artist Charles Biederman, whose theories about expressing the inherent structures of nature through “colour, plane and form”1 resonate in his early attempts to produce abstract sculpture. Lorcini did not immediately seek out metal as his sculptural medium. Working first in dimensional paper collage, then plexiglass and wood, he eventually chose to use metal because of its stability and permanence, its ability to reflect light, and its capacity for exploring variations in texture, colour, and rigidity. It also offered him clean sculptural lines and contours. As Artist-in-Residence at the University of Western Ontario in 1968 he expanded the range of these investigations. Lorcini’s new studio contained an industrial milling machine that he set upon to master. 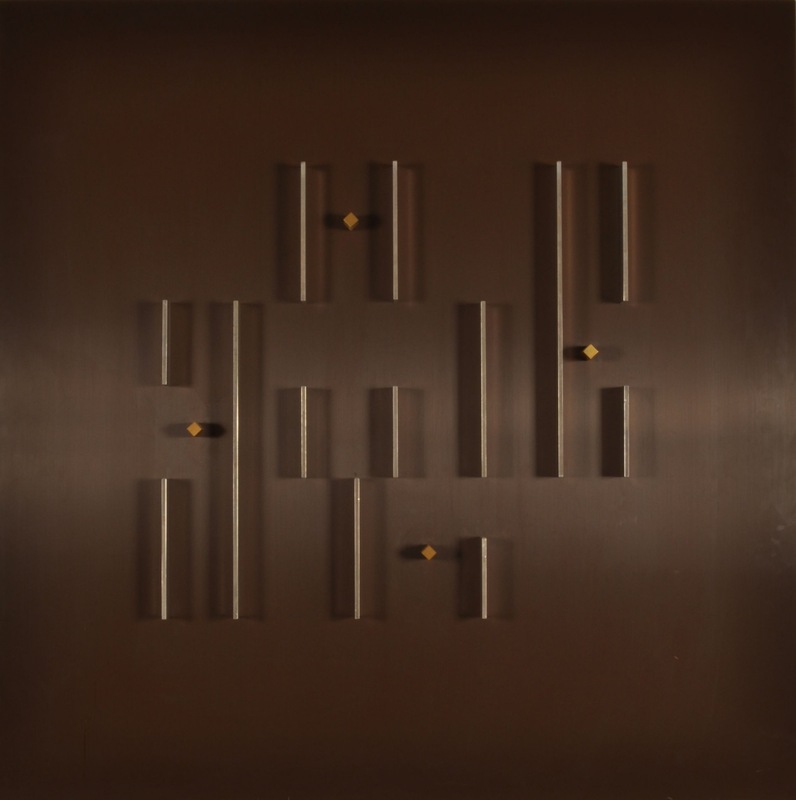 Omega – Mixed Doubles (1976) is one of Lorcini’s many relief sculptures that emerged in the 1970s. Its polished surface punctuated by geometric shapes, it strongly resembles the embossed prints of Yves Gaucher’s series Homage to Webern (1960s). In the 1970s, Lorcini would again shift the direction of his artistic investigations to include a return to freestanding sculpture. Travels in Wales and an encounter with ancient sculpture spurred the creation of monolithic forms, which were more concerned with occupying space and interacting with whole environments. 1. Elaine Hujer, Exhibition essay for Gino Lorcini: significant forms, Burlington Art Centre, 2011.